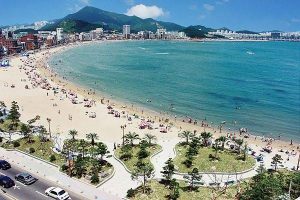 Thank you to all who have already registered and submitted abstracts for the 2019 International Ocean Colour Science meeting (IOCS-2019) which will take place in Busan, South Korea (9 -12 April 2019). Regular registration rates apply until 8 March 2019, so register online early to avoid paying the late registration fee (see the registration page for details). The registration process must be completed in order to submit an abstract for the meeting, apply for a scholarship or attend one of the training workshops (see https://iocs.ioccg.org/2019-workshops/). The deadline for submitting a poster abstract is 1 March 2019. The IOCS-2019 programme will include invited keynote lectures, emerging applications/science talks from space agencies, nine breakout workshops covering a wide range of topics, four poster sessions and a community Town Hall. The NASA Ocean Color Research Team (OCRT) meeting will take place on the 8th April, 2019, prior to the IOCS-2019 meeting, along with the training workshops. The NASA OCRT meeting and the training sessions are open to all participants (some training workshops may have limited capacity so register early). See the IOCS-2019 meeting website for further details. 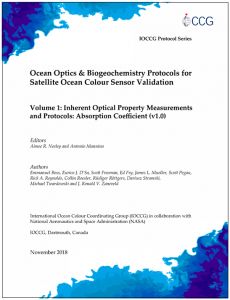 In situ optical and biogeochemical in- and above-water measurements are critical for calibration and validation of satellite ocean colour data products, and for refinement of ocean colour algorithms. The current NASA ocean optics protocols have served as international reference standards for the past ~20 years, but they now require updating. Over the past few years NASA has sponsored several international workshops, some in conjunction with IOCCG, to update and develop new community consensus protocols for ocean colour sensor validation. We are pleased to announce that the final version of the Absorption Coefficient Protocol is now available on the IOCCG website. This document provides a comprehensive overview of measurement, analysis and calibration protocols for state-of-the-art technologies that measure the absorption of particles in the water, or on a filter pad. Your input is important! Please visit the IOCCG website to view these protocol documents and submit your comments before they are accepted as the new international reference standards. 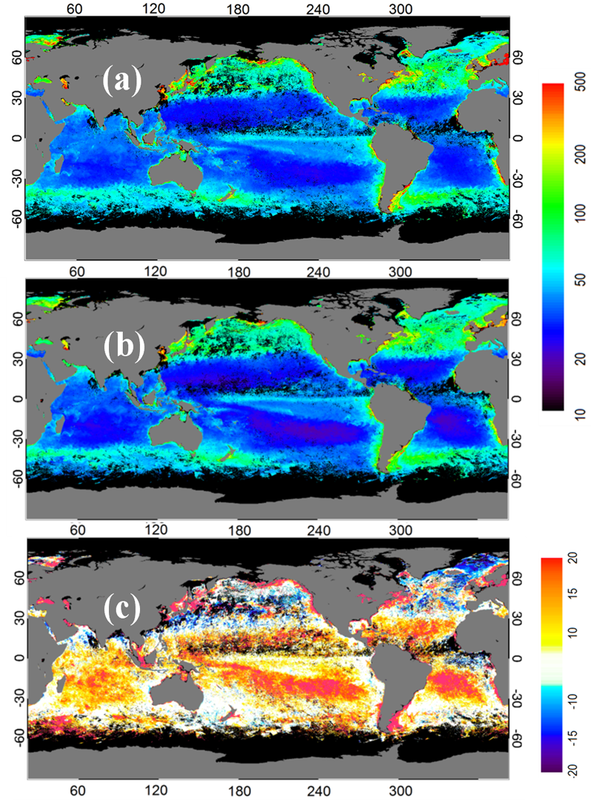 The NASA Plankon, Aerosol, Cloud, and ocean Ecosystem (PACE) project, in conjunction with the IOCCG, EUMETSAT, and JAXA, have initiated an aquatic primary productivity working group, with the aim to develop community consensus on multiple methods for measuring aquatic primary productivity used for satellite validation and model synthesis. A workshop to commence the working group efforts was held December 05-07, 2018 at the University Space Research Association headquarters in Columbia, MD U.S.A., bringing together 26 active researchers from 16 institutions. The group discussed the key differences, nuances, scales, uncertainties, definitions, and best practices for measurements of primary productivity derived from in situ/on-deck/laboratory radio/stable isotope incubations, dissolved oxygen concentrations (from incubations or autonomous platforms such as floats or gliders), oxygen-argon ratios, triple oxygen isotopes, natural fluorescence, and fast repetition rate fluorometry/electron transport rate/kinetic analysis. These discussions highlighted the necessity to move the community forward towards the establishment of climate-quality primary productivity measurements that follow uniform protocols, which is imperative to ensure that existing and future measurements can be compared, assimilated, and their uncertainties determined for model development and validation. The specific deliverable resulting from of this activity will be a living, community-vetted (open public comment period) protocol document, published in coordination with ongoing IOCCG protocol series. Learn more about this activity and view presentations from the workshop on the working group’s webpage. 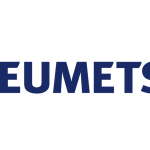 EUMETSAT will be offering training in the use of data products from the Copernicus Marine Data Stream prior to the IOCS-2019 conference. Funding support to attend IOCS-2019 is also available for those who will present work using Sentinel-3 marine data. This funding, and the training course, can be applied for during the abstract submission process, after registration for the IOCS-2019 meeting. Further courses will be run in 2019 – please check http://training.eumetsat.int for announcements and details on how to apply. For users wishing to collaborate on the application of Sentinel-3 marine data, there is funding available through the Copernicus Collaborative Exchange Programme (see https://www.eumetsat.int/website/home/TechnicalBulletins/Training/DAT_3894663.html). On 12 December 2018 Level-1B near real-time and non-time critical products were released for the OLCI sensor aboard the Sentinel-3B satellite (OLCI-B). The products have been available since June 2018 to the Sentinel-3 Validation Team and, with the December release, made public to all users. Product Notice for both OLCI-A and -B is available and describes the current Level-1B product status, data access, processing baselines, product quality and known limitations. Initial radiometric validation of OLCI-B using indirect methods over deserts, sun glint, deep convective clouds and oligotrophic water with Rayleigh atmosphere shows that OLCI-B provides measurements within the mission requirements of < 2% for the spectral range < 900 nm. OLCI-B radiometry is comparable to MERIS within about 1%. An updated processing baseline for OLCI-A was also implemented at this time with a minor update to the dark correction tables. OLCI-A and -B L1 Product Notice is available by clicking here. The FRM4SOC project, with funding from ESA, has been structured to provide support for evaluating and improving the state of the art in ocean colour validation through a series of comparisons under the auspices of the Committee on Earth Observation Satellites (CEOS) Working Group on Calibration & Validation and in support of the CEOS Ocean Colour Radiometry-Virtual Constellation (OCR-VC). The FRM4SOC project also strives to help fulfil the IOCCG In situ Ocean Colour Radiometry White Paper objectives and contribute to the relevant IOCCG working groups and task forces (e.g., the working group on Uncertainties in Ocean Colour Remote Sensing and the Ocean Colour Satellite Sensor Calibration Task Force). The project makes a fundamental contribution to the European system for monitoring the Earth (Copernicus) through its core role of working to ensure that ground-based measurements of ocean colour parameters are traceable to SI standards. This is in support of ensuring high quality and accurate Copernicus satellite mission data, in particular Sentinel-2 MSI and Sentinel-3 OLCI ocean colour products. The FRM4SOC project also contributes directly to the work of ESA and EUMETSAT to ensure that these instruments are validated in orbit. The final workshop took place on 4-5 October 2018 in NPL, Teddington, London, UK. The main objectives of the workshop were to present the major findings and recommendations of the FRM4SOC project, to present other recent relevant work, and to discuss the future of FRMs in ocean colour to help formulate a scientific road-map to 2020 and beyond. Presentations are available at: https://frm4soc.org/index.php/activities/final_workshop/ . The proceedings of the workshop will be published in a special issue of MDPI journal Remote Sensing. The consensus was that FRM4SOC activities are extremely useful and necessary for the community. They should include even more global cooperation for comparisons in the laboratory as well as in situ measurements. The community needs to quickly prepare for validation of hyperspectral sensors such as PACE, thus a suitable spec for the validation instruments is urgently needed by the manufacturers. Moreover, it is clear that a greater understanding of uncertainty in the community is needed. In December 2018, NOAA CoastWatch/OceanWatch had a soft rollout of two new online tools: 1) The new CoastWatch Data Portal interactive search tool (left image) and the OceanWatch Monitor, the ocean satellite product monitoring tool (right image). 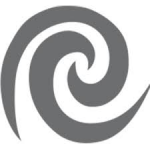 “News” items accessible from the CoastWatch homepage describe each tool. Please note that during the partial US federal government shutdown, these sites may not be updated. Left. The new NOAA CoastWatch/OceanWatch data portal interactive search tool. Right. The new NOAA OceanWatch Monitor ocean satellite data product monitoring tool (click to enlarge). More details about the First International Operational Satellite Oceanography (OSO) Symposium, 18-20 June 2019, Washington DC area (and the optional training day on Monday, 17 June 2019 at the same location) will be released soon. The NOAA CoastWatch/OceanWatch site will post a link to the OSO symposium announcement and registration site. The previous announcement can be viewed here. The Ocean Optics Conference Planning Committee invites suggestions from the scientific community regarding the feasibility of possible locations for the Ocean Optics XXVI Conference taking place in Fall 2022. In keeping with the customary rotation, the Planning Committee welcomes suggestions for conference locations outside of the United States. To submit locations for consideration, please respond to the questions on this survey by Wednesday, May 1, 2019 (11:59 EDT). Planning efforts are underway for Ocean Optics XXV taking place October 24 – 30, 2020 at the Hilton “Norfolk The Main” hotel in Norfolk, Virginia, USA. Information will be posted here (https://oceanopticsconference.org/) as it becomes available. The Optical Society’s (OSA) 2019 Hyperspectral Imaging and Sounding of the Environment (HISE) meeting will take place on 25 – 27 June 2019 in San Jose, California (see http://www.osa.org/HISE). HISE will be one of four topical meetings taking place at the OSA’s Sensors and Sensing Congress (http://osa.org/sensing), which will be held in conjunction with the Sensors Expo (https://www.sensorsexpo.com/). Meeting attendees will have access to the exhibit hall of the expo, which will feature more than 300 exhibits and attract about 6000 attendees, thereby providing plenty of opportunities for networking. The deadline for submitting the abstract and summary paper is 12 Feb 2019. A call for papers has been released for an open-access special issue in the journal Frontiers in Marine Science on the topic of “Remote Sensing for Aquaculture”. The submission deadline is 30 September 2019. See https://www.frontiersin.org/research-topics/9293 for a full description of the project. A special issue of the journal Applied Sciences on “Outstanding Topics in Ocean Optics” was published in the December 2018. 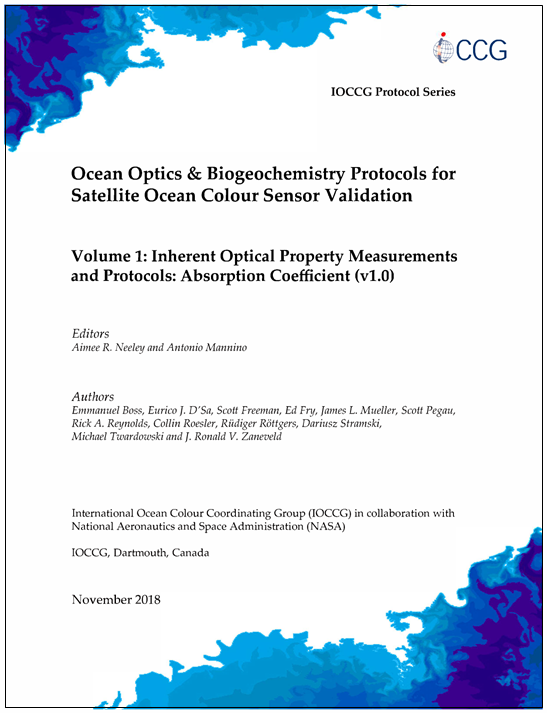 This issue includes 18 papers covering a broad range of topics in ocean optics (see https://www.mdpi.com/journal/applsci/special_issues/ocean_optics). Several new publications have been added to the IOCCG Ocean Colour Bibliography including a paper by Emanuele Organelli and co-authors (2018, Nature Communications) that deals with the open-ocean missing backscattering enigma. Observations of the particulate optical backscattering coefficient are critically limited by an incomplete mechanistic understanding of what particles generate the backscattering signal. To achieve a better understanding, optical models are employed. The simplest of these models — the homogeneous sphere — severely underestimates the measured backscattering and the missing signal has been attributed to submicron particles. This issue is known as the missing backscattering enigma. Organelli et al. 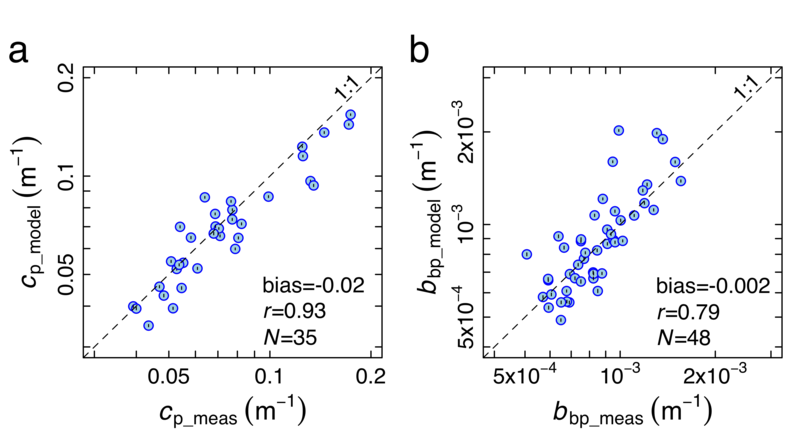 show that a slightly more complex optical model — the coated sphere — can predict the measured backscattering and suggests that most of the signal comes from particles >1 µm across the oligotrophic Atlantic Ocean. The authors confirmed these findings by independent size-fractionation experiments. These results demonstrate that the structural complexity of particles is critical to understand open-ocean backscattering, contribute to solving the enigma and open a new direction towards exploiting the full potential of optical backscattering observations for investigating the biological carbon pump. The coated-sphere model can simultaneously predict both beam attenuation and backscattering coefficients using particle size distributions measured between 0.59 and 60 µm by Coulter counter. Data were collected in the sunlit oligotrophic Atlantic Ocean along an Atlantic Meridional Transect (AMT). In another new publication Chengfeng Le and co-authors (2018, J. Geophys. Res. 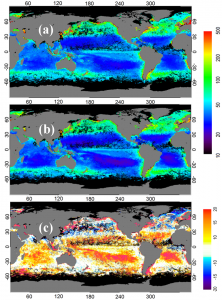 : Oceans) developed an empirical algorithm for estimating particulate organic carbon (POC) concentration in the surface ocean from satellite observations. The algorithm is formulated and validated using in situ POC data and remote-sensing reflectance (Rrs) data obtained from match-up satellite ocean colour measurements. The algorithm builds upon the band-difference algorithm concept, which was originally developed for estimating chlorophyll-a concentration in clear waters. This algorithm utilizes three spectral bands centered approximately at 490, 550, and 670 nm to determine a colour index (CIPOC), from which POC can be estimated from satellite measurements. For comparison, the blue-green band-ratio algorithm is also formulated using the same data set of in situ POC and satellite-derived Rrs. Results show that the colour index approach based on band difference can provide an alternative choice to reduce some of the limitations and uncertainties in previous methods. In the open ocean, the CIPOC index has a similar performance with the band ratio algorithm, but is less sensitive to artificial errors and noise. In coastal waters where the values of CIPOC are generally higher, the statistical parameters of algorithm performance are better for the CIPOC algorithm. Because the CIPOC algorithm is less sensitive to errors and noise in the satellite-derived Rrs, the image quality obtained with this algorithm can be improved for both open-ocean and coastal waters. This study represents significant progress in determining POC from satellite observations. MODIS-Aqua monthly mean global distribution of POC in March 2010 derived from (a) the blue-green bad ratio algorithm and (b) the CIPOC algorithm. (c) The relative differences between the two algorithms (see paper for details). This news bulletin includes: Registration opens for 2019 International Ocean Colour Science (IOCS) meeting, new IOCCG Report on Water Quality, AOP Protocols available for review, NASA/IOCCG aquatic primary productivity workshop, news from NASA, NOAA, EUMETSAT and ESA, successful launch of the Chinese HY-1C Mission, Ocean Optics XXIV meeting, journal special issues and new publications.